I really am channelling Agatha Christie today. First there were the psychotic schoolyard murder games of Danganronpa, and now The Ship is being remastered. Sorry—'Remasted'. 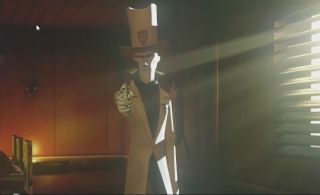 The Ship, released in 2006, is a game of cat and mouse aboard a range of 1920s cruise ships to which you've been invited by the illusive Mr X. You're given a target—another player—to hunt down and kill like a gentleman (or with a flare to the face). Trouble is, you're likely someone else's target, so what starts as jolly old seafaring devolves into murderous anarchy. As with many multiplayer games, after nine years it can be tricky to sustain an active player base despite a reported 250,000 people buying The Ship in 2015. It doesn't help that the in-game server browser no longer works. Now the old girl has pulled into dry dock for a refit—a complete HD remake releasing into Early Access February 15. The early build will include four maps and offer a 25% discount to anyone who owns the original. For the rest of us, it'll cost $20/£15.